Magnetic fields are caused by electric currents. Therefore, if a planetary body has a strong magnetic field there must be large electric currents within it, and this can tell us a lot about the interior. Whereas mass is the source of gravitational field, electric charge in motion - electric current -is the source of magnetic field. For magnetic field, the basic source is an electric current loop, and a circular one is shown in Figure 4.5(a). 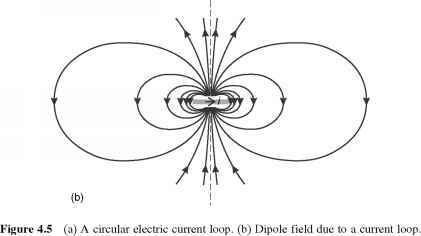 At distances that are large compared with the distance across the loop, the magnetic field is independent of the shape of the loop and the field is then called a magnetic dipole field. It has the form shown schematically in Figure 4.5(b), where the loop is presented edge on. The lines show the direction of the magnetic field, and their spacing is a qualitative indication of the magnitude of the field. Note that the field is rotationally symmetrical around the magnetic axis, which is perpendicular to the loop and passes through its centre. The distributions of currents in a planet are much more complex than a loop. Whereas the field sufficiently distant from the currents is a dipole field, at closer range it has a somewhat different form, depending on the configuration of the currents, and it is called a poloidal field. □ The basic source of gravitational field is the point mass. Describe the equivalent drawing to Figure 4.5(b) in this case. The gravitational field lines of a point mass would be radial, and would point inwards to denote attraction. The increase in the spacing of radial lines as distance from the mass increases is a qualitative representation of the decrease in the size of the force with distance. The direction of the magnetic dipole moment is the same as the direction of the magnetic axis. The mechanism for sustaining magnetic fields in planetary bodies is not fully understood. The general idea is that the process starts with an electrically conducting fluid in motion. In planetary bodies this will be due to thermal convection. The presence of a small external magnetic field will set up electric currents in the moving liquid that generate further magnetic fields. This influences the liquid motion in such a way that the disordered electric currents are enhanced and coordinated so that the field strength is increased until there is as much energy in the magnetic field as in the liquid motion. If the rotation of the planetary body is sufficiently rapid then the liquid motions are coordinated such that a strong poloidal field is established. Once the field is established, it is probably unnecessary to have a small external magnetic field to sustain it. Thus we have the current sustaining the magnetic field that sustains the current in the moving liquid. This is called a self-exciting dynamo, by analogy with the familiar manufactured device that operates in the same basic way. The energy in the field comes from the kinetic energy in the liquid flow. In a manufactured dynamo the kinetic energy comes from the rotation of a coil of wire. The fluid motions tend to decline through viscous dissipation, and the currents themselves tend to diminish through the electrical heating they cause. In the Earth, where the magnetic field originates in a convective outer core of liquid iron, these losses would eliminate the magnetic field in the very short time of about 10000 years. The losses need to be offset by internal energy sources. In planetary interiors convection can be sustained by deep-seated heat sources, as you will see in Chapter 5. The crucial role of rotation leads to a fundamental theorem, the Cowling theorem, which states that the field and the rotation cannot have the same symmetry (Thomas George Cowling, British physicist, 1906-1990). This means that the rotation and magnetic axes cannot coincide -there must be an angle between them. Most dynamo models require this condition. The currents inside a planetary body are distributed throughout the conducting region. Consequently the field at, and not far above, the surface of the body is very different from that of a simple loop. The differences can be used to constrain the distribution of the electric currents in the interior, somewhat as the extra terms in the gravitational field can be used to constrain point-to-point variations in density. Nevertheless, the existence of a dipole field at sufficiently great distances means that we can specify the strength of the source of the field by the corresponding size of a magnetic dipole moment. The known values are given in Table 4.2. From a large dipole moment we infer the presence of a considerable body of electrically conducting fluid in motion within the planetary body. Figure 4.6 shows the magnetic axes of the five planetary bodies that have large magnetic dipole moments - the Earth and the four giant planets. Where the magnetic axis passes through the surface of the body we have the magnetic poles. The magnetic equatorial plane (Figure 4.6) is perpendicular to the magnetic axis, and they intersect at a point that is the centre of the far field. You can see that this point is displaced from the centre of the planetary body, and so the currents are not symmetrically distributed around its centre. The magnetic axis does not coincide with the rotation axis - except for Saturn, where the angle between the axes is close to zero. Saturn thus violates the Cowling theorem, which is worrying, though this might be a transitory circumstance, planetary magnetic fields being variable. Magnetic fields are subject to small variations in magnitude and in the direction of the magnetic axis - those in Figure 4.6 are for the present time. For planets with rocky surfaces these variations can be traced through rocks that retain the imprint of past magnetisation by the field. 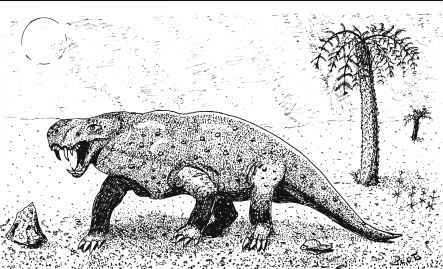 One way in which this can happen is through the solidification of a magnetised molten rock. Figure 4.6 The magnetic axes of the five planetary bodies that have large dipole moments. This remanent magnetism can be used to trace the history of the field, particularly if the time of solidification has been radiometrically dated. For the Earth it is known that the direction of the magnetic axis has varied erratically, though the inclination with respect to the rotation axis has never been very great. In addition, the field has reversed in direction many times. Each reversal takes about 0.01 Ma, and during it the field declines in strength to zero, and then grows in the opposite direction. During the last 80 Ma these magnetic reversals have occurred at intervals of 0.1-1 Ma; the last time this happened was about 0.7 Ma ago. Earlier, there were periods when the reversals were considerably less frequent. Intervals between reversals that exceed 20 Ma are called superchrons. For example, one superchron lasted from 118 Ma to 83 Ma ago. Numerical simulations of the dynamo theory as applied to the Earth's interior do exhibit magnetic variations, including reversals. In the case of the Earth this long-term variation in the frequency of reversals is probably due to the effects on convection of fluctuations in temperature at the top of the liquid iron core where it meets the rocky mantle. The reversals themselves might owe much to chaos - large effects from small causes. Other sources of magnetic fields, from electric currents in the upper atmosphere to permanently magnetised rocks at and below the surface, are weak, and are sufficiently disorganised on a planetary scale that their net contribution to the dipole field is zero. Note that in planetary interiors there is also a field from a current configuration that does not generate a dipole field at any range. This is called a toroidal field. It has no substantial external manifestation, and so will not be discussed further. Making use of what you learned about the planets in Chapter 1, outline reasonable hypotheses based on the self-exciting dynamo mechanism to explain why the Earth and the giant planets have large magnetic dipole moments, but the other planets do not.